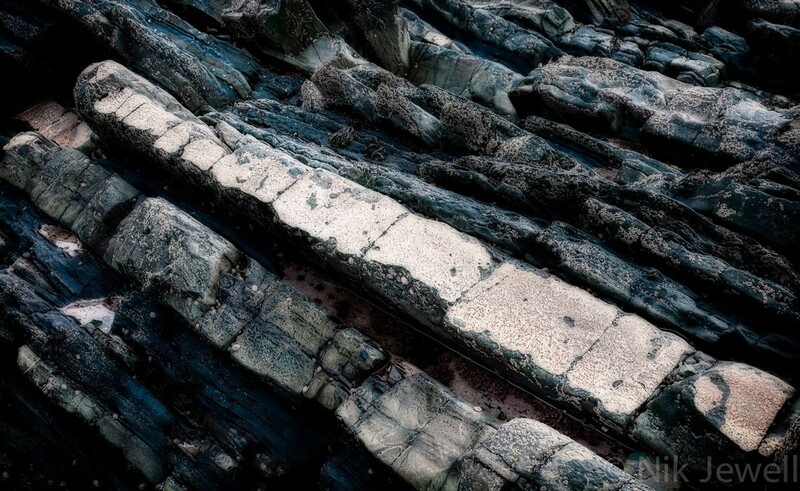 The rocks of the Culm Coast are famous for their quartz banding. Some time in your life you will almost certainly have seen a picture of our distinctive blue/grey sandstone pebbles with white quartz bands running through them. If you’ve been to North Devon/Cornwall you will certainly have seen them on top of, or embedded in, walls, in rockeries or decoratively utilised in some other way by homeowners around here. 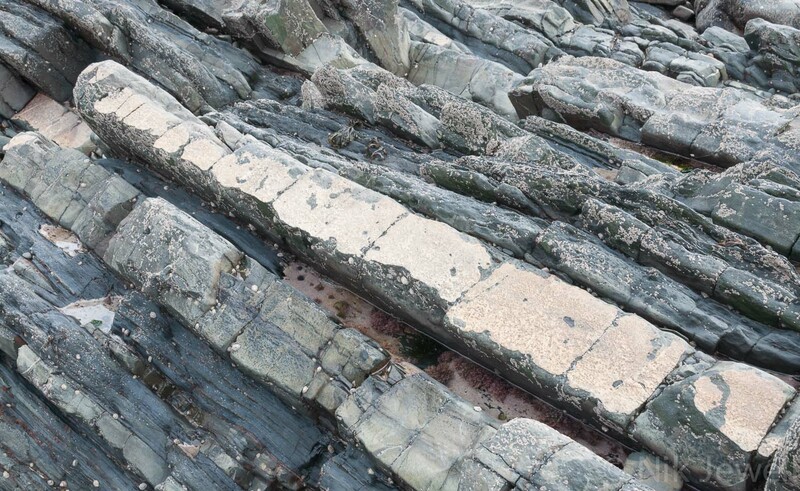 This banding sometimes takes place on a much grander scale and can be seen striating the extensively folded cliffs but it is rare to find it exposed on a horizontal plane such as in the image here. This was taken on the south side of Gull Rock, below Marsland Cliff, which lies a long low tide boulder hop to the south of Welcombe Mouth. In a small area here are many rocks topped in this way and because the quartz is so much harder than the sandstone it forms a protective coating. As a result these quartz topped rocks and ridges are very prominent as they stand proud of the far more quickly eroding rocks around them. The barnacles on the rocks complement the quartz on the rocks and lend the whole image a slightly other worldy organic feel. My aim with this image was to strongly emphasise the quartz band on the central diagonal whilst generally enhancing the colour in the rocks and bringing out the barnacles clinging to them. OnOne's new Dynamic Contrast filter in Perfect Effects 8 was used to massively boost the local contrast before the image was heavily LAB saturated to bring out colour gradations in the rocks. The image was then put through the Midnight filter in Color Efex Pro. This blurs and darkens the image so a gradient tool was used in Photoshop to mask the effect from the diagonal quartz band in the middle of the image. If I hadn't boosted the contrast and colour first the outer edges would have been turned into a muddy mess by this process, but here enough detail is maintained to keep interest on inspection but not too much to lead the eye away from the central diagonal.